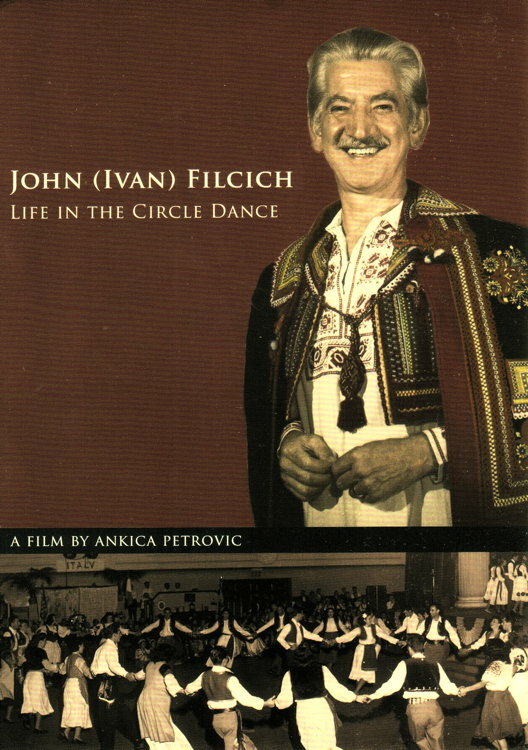 Ivan Petar "John" Filcich (Filčić) was born in Fiume, Italy, in 1924. The village is today called Rijeka in Croatia. When John was born, the village was called Fiume, the post World War I "free city-state" which was later annexed by Italy. For his father it was in Hungary, for his grandfather it was in Austria, and even earlier the area was part of Napoleon's Illyrian Provinces. He immigrated to the United States when he was eight years old. His family settled in Gary, Indiana, the steel mill city with Croatian, Serbian, Polish, and other Slavic cultures and has had many years of experience with thier music. He later moved to Arizona. 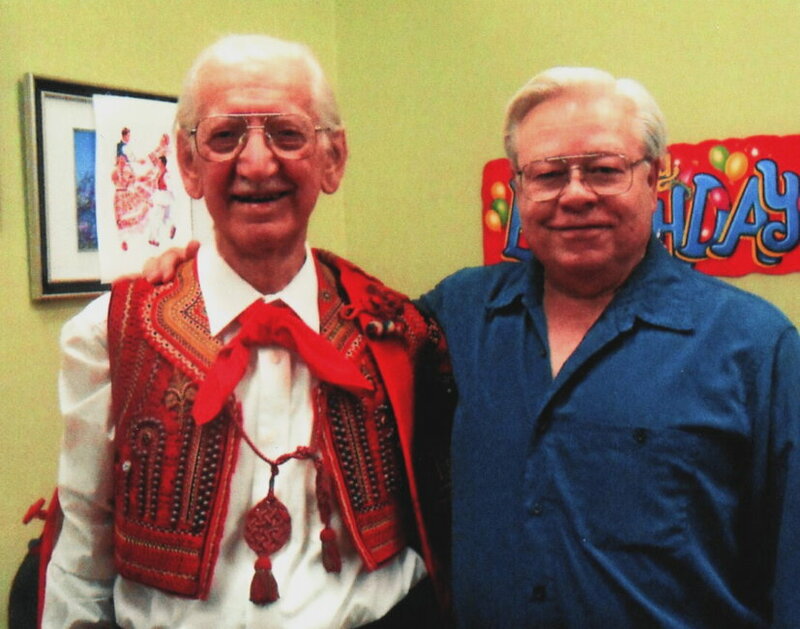 In 1935, when his father gave him an old phonograph and a stack of Bulgarian, Croatian, Macedonian, and Serbian Records, his interest in international music was fostered. 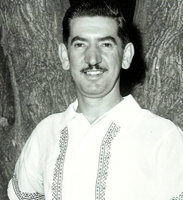 In 1946, the family moved again to California where John saw foreign dancers in their native costumes. 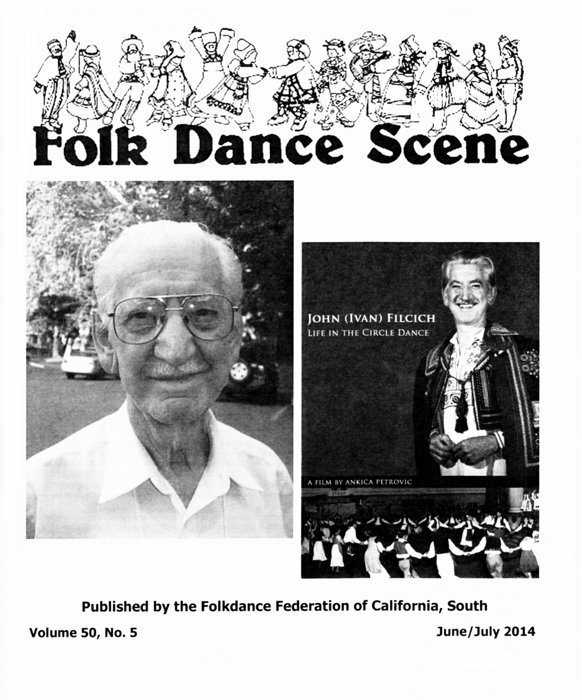 By 1947, John was folk dancing every week in Oakland, California. With singleminded dedication, John devoted himself to the study of the origin, history, dance, music, and language of his people. 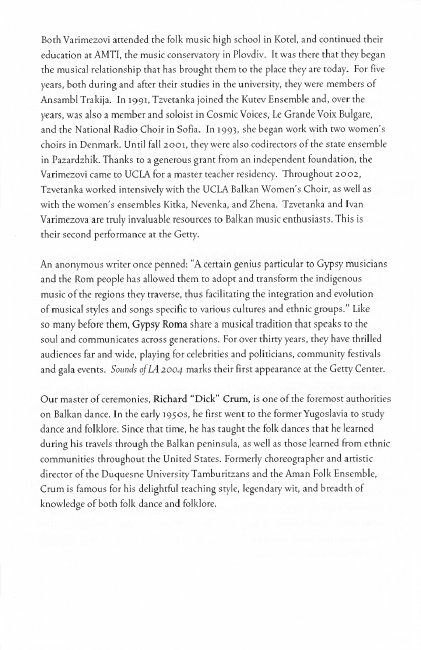 Then, in 1948, the International Institute of Oakland asked him to form a Yugoslavian dance group to perform at the Festival of Nations. He did even more, he formed two groups  Croatian and Serbian  and he was also dancing six nights a week! 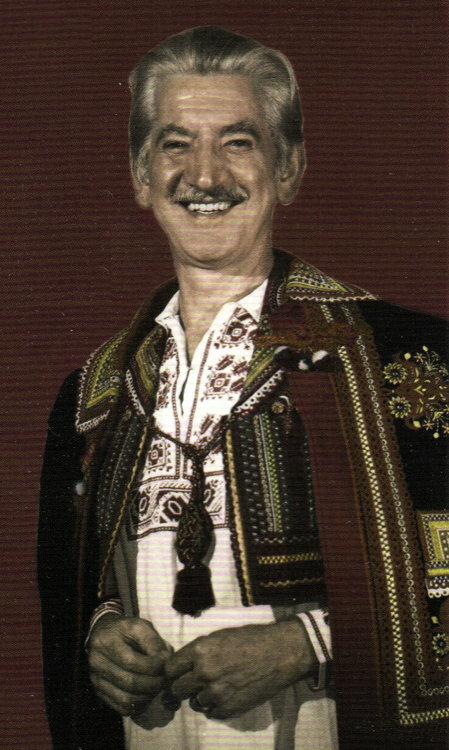 This led to his teaching of Yugoslavian "kolo" (circle) dances at the camp and his subsequent founding of the San Francisco Kolo Festival. 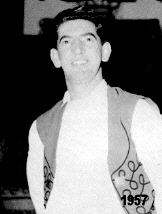 According to his niece, Sharen Skorup, "And my mother's brother, my Uncle John, was in the music business and was into dancing. As a kid I worked in his record store in Oakland. 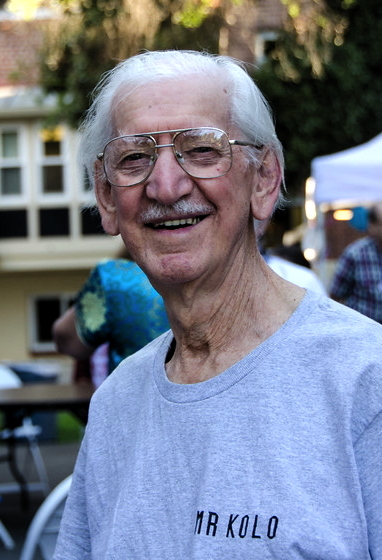 Uncle John started the whole Kolo movement here in the Bay Area back in 1940. 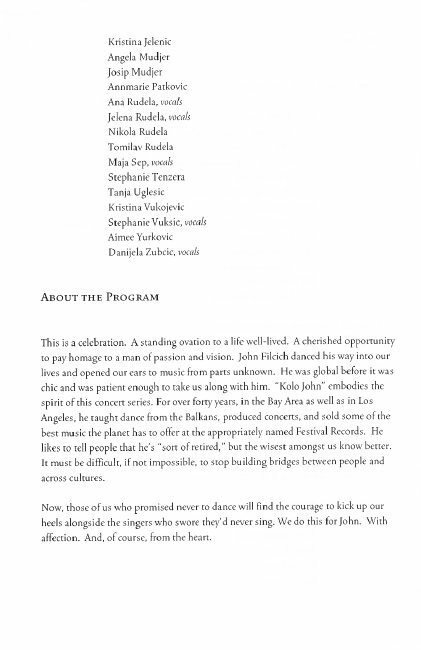 He had a performing dance company of mostly Croatians. That was before I was born. In 1952, he started the Kolo Festival as a benefit for a friend and well-known folk dancer named Vyts Beliajus." The festival's name was later changed to the California Kolo Festival." 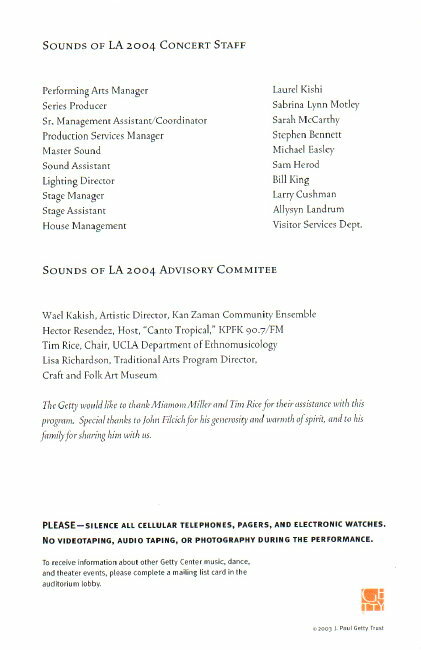 John was a credited advisor on the feature documentary film "American Gypsy: A Stranger In Everybody's Land," written, produced, and directed by Jasmine Dellal. He speaks five languages. To his many folk dance friends, he is known as "Kolo John," a moniker that Millie von Konsky solidified in print in "Let's Dance" magazine in November, 1957. John, with his Festival Records label, was a principal supplier of folk dance recordings to North America and the world. 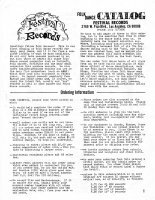 His record shops, Slav-Art Music Center in Oakland, Festival Records in Los Angeles, and Festival Folk Shop in San Francisco, were must stops for folk danceers, square dancers, ethnic musicologists, and Gypsies from all over the world. Because of his life-long interest in the Rom (Gypsy) culture, he is often invited to their weddings, religious celebrations, and other community activities and was the North American supplier for Gypsy music, candles, and other items for many years. 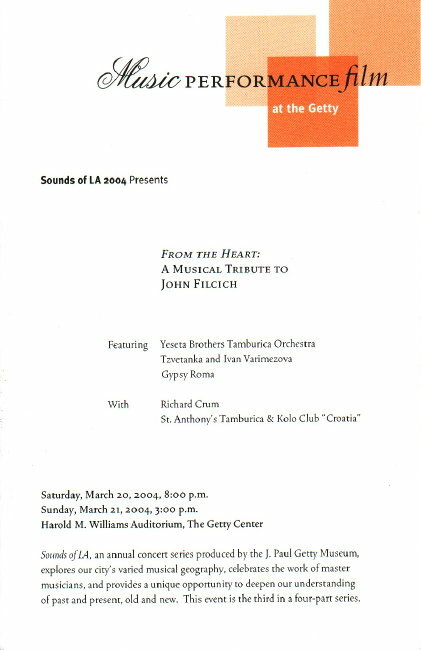 On March 20 and 21, 2004, 'From the Heart: A Musical Tribute to "Kolo" John Filcich' took place at the Harold M. Williams Auditorium, J. Paul Getty Center, Los Angeles, California. 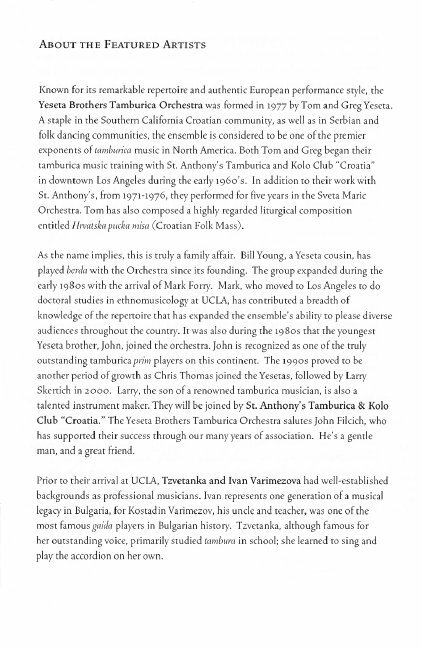 Some of L.A.'s finest Eastern European folk musicians paid homage to "Kolo" John Filcich. 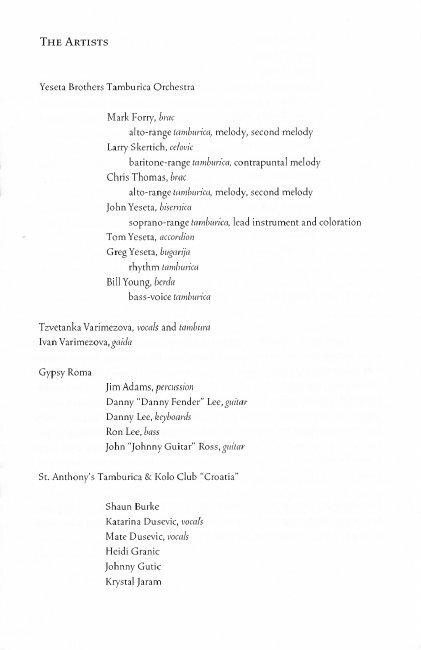 Performers included the Yeseta Brothers Tamburica Orchestra, Tzvetanka and Ivan Varimezova, and the Gypsy Roma Band. 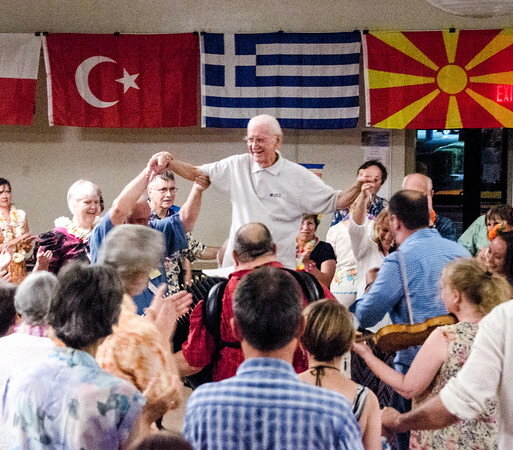 Igra Kolo: Dance Kolos with John Filcich. Oakland, 1953. Dance Instructions. Kolo Party Record, FLP 1505. Sing and dance the kolo - a songbook. Vol. 1. San Francisco, California: Kolo Festival, 1966. 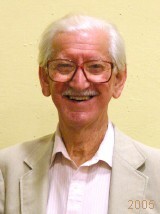 Dances John has taught include Ajd Noga za Nogama, Armenian Misirlou, Belo Lence, Bertchesgadner Bayerischer Polka, Bibersko Kolo, Biserka, Bitoljka, Bojarka (Biserka), Bunjevačko Rokoko Kolo, Čačak, Čačansko Kokonješte Kolo, Čarlama, Cigansko Horo (Ciganskoto), Ciocârlanul, Clap and Turn (Polka), Coprnice, Couple Drmeš, Couple Hasapiko, Croatian Medley, Čuješ Mala, Čuješ Mala-Šušu Mile, Ćukaričko Kolo, Čukaričko Kokonješte Kolo, Ćuperlika, Dajčevoto, Debki Zaroura, Dimke ela Dimke, Dirlada, Divna Divna, Djurdjevka Kolo, Drhtavac, Drmeš, Drmeš Circle, Drmeš Couple, Drmeš for Threes, Drmeš for Fours, Drmeš No. 2, Drmeš iz Velika Gorica, Drmeš Medley, Eleno Mome, Epirotiko, Erdeljanka, Ersko Kolo, Gae Gordons, Gaitani, Grigoro Hasapiko, Haj Haj Bože Daj, Hajd' na Lijevo, Hasapikos, Hiotiko Syrto, Homoljanka, Hora pe Gheaţa, Horom Horom, Hrvatsko, Idam ne Idam, Igrale se Delije, Jeftanovićevo Kolo, Jesam Li Ti Jelane, Jovano Jovanke, Karagouna, Karsi Bar, Kasapsko Horo, Kastorianos, Keleruj, Kiša Pada<, Kokonješte Kolo, Kolo Kalendara (Kalendara Kolo), Kopačka, Kostursko Oro, Kozačko Kolo, Kraljevo Kolo, Krecavi Ketuš, Kriči Kriči Tiček, Kritiko Sytro, La Bastringue, Laz Bar, Lepa Maca, Lepa Moja Milena, Ličko Kukunješte (Klub Kolo), Ličko Kolo, Makedonka Kolo, Makedonska Devojče, Makedonsko Devojčko Kolo, Malo Kolo, Mangupsko Kolo, Marice Kolo, Milanovo Kolo, Misirlou, Mista, Mitilineikos Horos, Moldavian Hora, Moravac (U šest Koraka), Narodno Horo, Natilijino Kolo, Nebesko Kolo, Neda Grivne, Neda Voda Nalivala, Niška Banja, Oficirsko Kolo, Pentozali, Pljeskavac Kolo, Pljeskavac Kolo (with claps), Pok-Šotiš, Polomka, Pompouri, Posavski Drmeš I, Posavski Drmeš II, Posavski Ples, Poskakuša, Poskok, Pravo Makedonsko Oro, Predaričko Kolo, Prekid Kolo, Prsten Me Padna, Radikalka Kolo, Razgranjala, Rezijanka I, Rezijanka II, Robin Ddiog, Rokoko Kolo, Rukavica, Rumunjsko Kolo, Ruzmarin, Šano Dušo, Sarajevka, Šareni Čorapi, Sarent Chargu, Savamalsko Kolo, Savila se Bela Loza, Seljančica, Selsko Oro, Serbian Medley I, Šetnja, Šilovaško Oro, Sirdes, Slavjanka, Slavonsko Kolo, Şobolanul, Splitske Igre, Srbijanka, Srpkinja Kolo, St. Gilgen Figurentanz, Stara Vlaina, Šumadijsko Kolo, Šušu Mile, Swiss Circle Mixer, Syrtos, Tamburica Polka, Tamzara, Teško Oro, Then Irthe Mais, Ti Momo, Tin Tin, Trava Trava, Trgovačko Kolo, Tri Godini, Triglav Waltz, Trite Pŭti, Triglav Waltz, Trojanac, Tropnalo Oro, Tsamikos, U Šest (Moravac), Veliko Kolo (John's signature dance), Zabaljka, Zaplet Kolo, Zetsko Kolo, Žikino Kolo, and Zwiefacher. 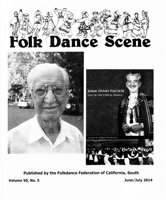 On Sunday, September 11, 2016 at 1:01 p.m., Ivan (John) Filcich wrote: This was the culmination of the Candlelight Ceremony at Stockton Folk Dance Camp 2016. It is held each of the two weeks to welcome the dancers who are there for the first time, this year about 30. All campers each receive a small candle while the "Each candle lights anew" song is song by all, led by a chorus. A large lighted candle is brought in and set in the center of the floor on a small table. The 'old timers', having been at camp 25 or more years are asked to make a circle around it. Then the first-timers are asked to form a circle around them, finally all the others the third circle. Since I am the oldest in attendance at Camp, 67 consecutive years, I am asked to light my candle and then light the candles of some of the others who then will light all the others. 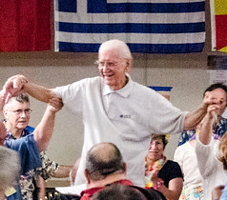 The master-of-ceremonies (Bruce Mitchell, past director of the camp, and a few years behind me in attendance) asked me to lead the usual dance, Lesnoto Oro. The entire orchestra then followed me around the floor filled with a circle of dancers, the drum player at my side, which is the custom in Balkan tradition. To my surprise, after a long dance to several Lesnoto songs and the line circled around to a logical end, the drum was set in front of me and two men ready to help me to the top (the picture). Later, hands free, I waved to the cheering crowd. 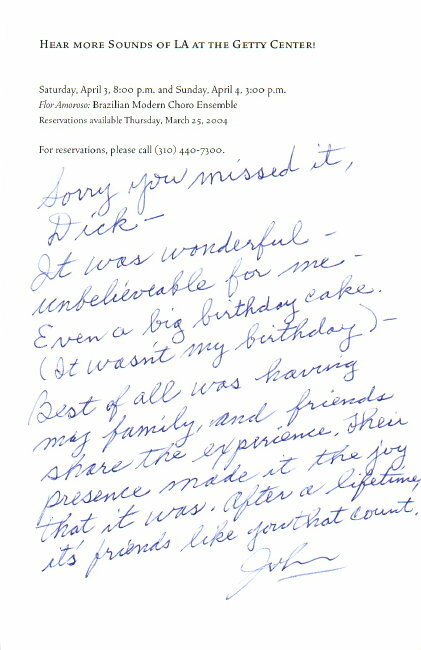 This was a great honor indeed! "Life in the Circle Dance"